Antiques challenge. 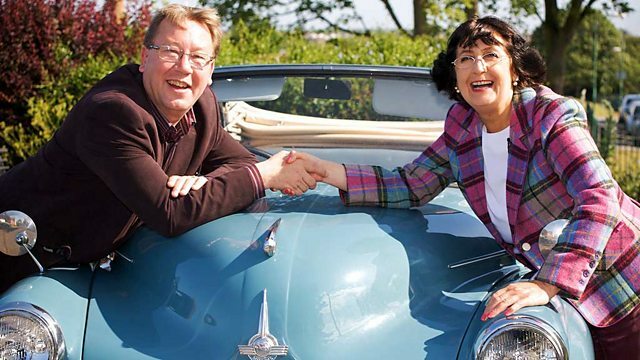 David Harper and Anita Manning embark on the final leg of their trip, starting in Ayrshire and travelling to the Isle of Bute, Glasgow and Renfrewshire. and the queen of the auction room Anita Manning. -We're in your neck of the woods. -We're in my neck of the woods. -Good buying venues in these parts, Anita Manning? We are indeed just outside Glasgow. It's been a fun old Road Trip. Time for a bit of nostalgic reflection perhaps. Well, it's been a lark. It's been a great lark. Yep, yep, and it has been so much fun. -And we've seen wonderful places, David. I will miss you, Anita. It has been a really great adventure. has already set her sights on someone else. but could he be about to fall for the wrong thing? Oh, John, here I am looking at a pair of oriental vases. I can sense myself getting into all sorts of trouble here. in their sturdy little 1965 Morris Minor Convertible. And our little car has just behaved like a dream. -She's been a little buzzer, hasn't she? -I'm going to miss her. -I might even miss you. Our lovable duo started this trip with £200 each. On this final stretch, David has £429.84 to spend. and the competition's heating up! -Well, I'm a wee bit ahead of you, David. You're miles ahead, it's ridiculous, and should be actually illegal. and finishes at this week's final auction in Paisley. where he's meeting a dealer also called David. Stand by. -Keep it nice and simple. Two Davids together, eh? And he's quick to spot something of interest. And that's that big lump of glass screaming the 1960s. So cool and so stylish, very organic in its twisty shape. But look at the light fitting itself. That flying fish mark is a Strathearn Glass mark. Strathearn Glass was manufactured from 1965 to 1980.
similar to the hugely collectable Italian Murano glass. from where we are standing right now. It's bang on trend and I want it so badly it's unbelievable. Its ticket price is £95, but will the other David be willing to do a deal? So, David, do you love 20th-century design or not? It's not really my thing, but I can appreciate that it is attractive. Right. That's bringing the price down, then. -Not looking too hopeful on that discount. -Maybe use some of that Harper charm. -Not quite what I had in mind. -What's the best on that for me, trade? -So that's it, as we say, the death? -It is the death, yes. Well, I think I've got to have it, David. Thank you very much. heading boldly towards the final auction. Anita is ten miles south, in the town of Kilbirnie. Anita is catching up with girlfriend Greta. It's lovely to see you again and to be back in the Stirrup Cup. Anita has just over £565 burning a hole in her pocket. Can she spend some of it in here? Tell me a bit about this. built it himself with its working steam engine inside. will thrifty Anita think it's worth the financial risk? -I do like it. I'm sorely tempted. -You can't lose money on that. I know that I quite possibly could. It's a substantial buy. -It's not a modest buy. You wanted to come in and spend 30. Clearly Greta's dealt with Anita before. could decrease its value at auction significantly. What is the very bottom that you would take for it? -I thought you were going to say 150. -I can't be that much in loss. -Would you take the 200 for it? -200, that's lovely. Thank you very much, Greta. on a bit of a gamble item. Perhaps time to get back to some familiar ground, Anita. Jewellery. -I was looking at this little brooch here. -It's just a pity there's not a name on it. I don't see a sculptor's name on it. I think this is quite a nice thing, Art Nouveau, and I love that period. It's a piece of costume jewellery and I think it's very sweet. It's a bit low. I was thinking nearer 40. -Well, if I could get even 32. -Could you go to 30 for it? -Could we go to 30? and is on her merry way. Well, I hope my purchases will keep my profit afloat. -And good luck to you. to the beautiful Isle of Bute. one of the most spectacular Gothic revival buildings in Britain. David is meeting Head of Collections, Alice Martin... Lucky old Alice. -Hi, welcome to Mount Stuart. surrounding the family who created it. Alice, this is some entrance hall, is it not? This is a house. It is a house, yes. It climbs to about 89 feet. It shows the stars in the northern hemisphere. who share common ancestry with the Scottish monarchy. So, how many generations, then, do the family go back here? The family's involvement in the island goes right back to the 1300s. married Robert the Bruce's daughter, Marjorie. and all of those great figures from Stuart royal history. The house was originally built in the 1700s but burnt down in 1877.
the richest man in Britain, rebuilt it in the 1880s. Unsurprisingly, no expense was spared. and is estimated to have cost around £89 million in today's money. Well, you would if you could, wouldn't you? from the Sistine Chapel, for example. All of the marble that you see around here is Italian and Sicilian. and built a worker's village for all the people that it took. -It sounds like a movie, doesn't it? -It's such a great script, that. The house also comes equipped with some great historical characters. was the first Scottish Prime Minister of the United Kingdom. from the spectacular grounds here. -OK, so this is our grand dining room. A lot of the money that built this house comes from Wales and coal. by building massive docks, which were known as the Bute Docks. and claims to have the first indoor heated pool in the world. It was the most modern house in Britain. -..for the very rich late-19th century family. that didn't get finished when the Third Marquess died in 1900. -Sorry, the house was never finished? now managed by the Mount Stuart Trust. based on its original designs. Anita is in the traditional Scottish holiday resort of Largs. makes regular trips from here in the summer. Anita's catching up with yet another old pal at Narducci Antiques. she's still got just over £335 left to spend. I quite like this desk piece here. your papers and envelopes and so on in there. -Nibs or stamps or whatever. Probably... What would you say? Turn of the century? -Turn of the last century, yes. And these wee chookie birdies. They're sweet, aren't they? Lovely. This piece is fresh in today, so no ticket price. Chance of a bargain, perhaps? I'd like to be paying probably about £20 for it. -I was thinking more of around the 45 mark. -Could you come further down? Could you come to 25? -30, how does 30 sound? Do you know, Franco, we're getting there? -I see you winning this one, do you know that? -Do you know? I do too. Another dealer who knows our wily Anita's ways. So, that's one item down and another one still to play for. -For me, it's a little piece of sculpture. It's quite an unusual piece, a wee centrepiece for a table. When I looked at it, I thought, "Is it brand-new? "Where does it come from? Is it just a piece of nothing, really?" In the end, I didn't care because I liked it. and all that sort of stuff. which could make it rather sought after. For you, I'll do that for £25. 25?! Come on, Franco, you must know what you're selling here. I would really like to be buying it for a tenner. Try again. Try me again. Go on. I'll throw a cuddle in. -I'll throw a cuddle in if you say yes. -Let's go for both of them. OK, thank you. Oh, Franco. I say, Franco definitely deserves a kiss. He's been incredibly generous there as Anita is about to find out. and Franco has just pointed that out to me. You'd have paid me fortunes. You'd have paid me fortunes. I would have paid you another £3. Put it there, before you change your mind. No, I'm not changing my mind. A deal's a deal. That's unbelievably kind of you, Franco. and a fruitwood letter rack. And that wraps up Day One. and we're in Anita's hometown of Glasgow. It suddenly got much warmer when we crossed the border, didn't it? -Palm trees appeared and everything. It's always Mediterranean climate in Central Scotland. Ha! Anita had a great day's shopping yesterday. for a bargain, leaving her with just under £300 to spend. David, however, bought just one item, a Strathearn lamp. This means he has nearly £350 to splash today. home to a wealth of trendy bars and restaurants. He's visiting Real Deal Antiques - I wonder where that name came from. A bit of a tight squeeze in here. Whoops. It's a broken one! it just adds a little bit of character. I'm not sure Michael's convinced. A bit more care needed, I think, David. with their original little canisters in there. just after the Napoleonic wars. -Tea used to cost a fortune, didn't it? of a servant girl, so that is pretty expensive stuff. when Portuguese Princess Catherine de Braganza married Charles II. Known as something of a trendsetter, her taste for tea soon caught on. This one's 1820, Regency, mahogany, sarcophagus shape. Ticket price £25. Looks rough to me. But those things, 20 years ago, in mint condition was £300. Yeah, I can remember that. In worn-out condition like that, a restoration piece, was 100. -Now, it is a tenner's worth, isn't it? What is it? Go on, then. Let's have that. It's a good start. there's plenty more to see. I know this stand is silver-plate. ..I think, was a trophy maker in Glasgow. Could it be reused as a trophy for someone else? piece when you're in Glasgow, isn't it? so it's very thin silver on a stand. OK, we'll do that for 15.
and that's another swift deal for the silver trophy. -Now that, I imagine, is a Henry Moore. Well, if that was a Henry Moore, you and I would be retired, I think. Well, in my view, it's got nothing to do with Henry Moore. Anyway, the ticket price is £22. I've probably had that about nine months. I can't really tell you where that came from. -and nobody has spotted it as a Henry Moore yet? It's quite good fun I think, actually. It's not bronze, it's just metal, isn't it? It's a bit mad. Is that a five-pound note? That's a good tenner's worth. Go on, I'll give you ten quid for a Henry Moore. Marvellous. I'm done. That's brilliant. I've bought three things. Let's get out before I smash something. Quite right. That's a total of £40 for three lots. Good job. Anita is also in Glasgow. and bestselling recording artists of his generation. -It's lovely to meet you. largest collections of Harry Lauder memorabilia in the world. -Would you like to come in and see the collection? Who was Harry Lauder? What was his background? Did he come from Glasgow? outside Edinburgh, and his father was a potter. very early on in his life. and eventually ended up in the mines. while working gruelling 12-hour shifts with no natural light. It seems an unlikely background for a theatre performer. in a way, he began entering competitions. what were called semi-professional offers of work. when he had an offer to tour the country with a concert party. all over Scotland and it's a fantastic apprenticeship for him. that his career really took off. a make-or-break exercise and he got lucky. by telegram to come and go on that night. and after that offers of work flooded in. and play a woman or he'd play a whole range of people. with the rise of the gramophone. and was the first British artist to sell one million records. -people are still singing these songs today. to take his act to the United States, again with unbelievable results. He was hugely successful there. Lauder met with five American presidents. He had the world at his feet when World War I broke out. saying that his son had been killed in action. Lauder's focus moved from show business to the war effort. he took his show to the troops in the trenches to boost morale. He even tried to enlist himself but was too old. He was very concerned about the troops. to them after the war? How are they going to survive? and clearly poured all his energy into doing this. In 1919, Lauder was knighted for his work during the war. with his generosity, gentle humour and catchy tunes. David is nearby, visiting Glasgow City Antiques. He's got just under £310 left to spend. So, this is my last chance on this WHOLE trip to pull it back. One more purchase and I can't go the safe route. Can dealer John help him find that winning item? ..neither does the ticket price of £220. I can't help be drawn to them. late-19th century Meiji-period Satsuma vases. A pair, John. What's wrong with you? It's make or break. David needs to seriously think about this. They're beautiful vases but severely damaged. Can I buy them for sub £100? to buy a pair of smashed Satsuma vases. I'm going to have to have them. I love them so much I don't care. -Wish me all the luck. Wow, I don't believe it. SO badly damaged for the all-important last auction. and the district of Govan. with just under £300 in her pocket. Harley-Davidson. Vroom, vroom. Vroom, vroom. -It's a big adventure playground. -John, where did this come from? You've got to tell me. We got that a while back from another private dealer. -It's papier-mache and some sort of fairground attraction. I've not got a lot of origin information about it. I know, but it's such a hoot. -It brightens up the place as well, you know? Yes, does she love him enough to fork out some serious cash? Remember, you've already taken a Titanic-size risk on this leg, Anita. -Is this guy for sale? -He should be OK there. Anita is way in the lead, but one wrong buy could cost her dearly. -Tell me what you might look for him. -He's priced about £60 just now. -It is just such great fun. Would you take £40 for him? -I could do him... 45 probably would be the best. I'd be sad to see him go, but he has been here a wee while. -Well, I think maybe he's got a new home then at 45. Put it there, John. That's great, thank you. -Thank you very much, Anita. -You're coming home with me. -Thank you very much, John. -Thank you for your custom. That last purchase for £45 wraps up this trip's shopping. and her potentially valuable Christofle centrepiece. She also bought an Art Nouveau brooch and a letter rack. Anita spent a total of £318. David, for once, has spent less than Anita, just £220. on a pair of Meiji Japanese Satsuma vases, which are bust. But what do they think of each other's final purchases? Now, this is where it starts to get serious - the Titanic model. but I'm hoping... Please! ..it's going to lose her a bit. The vases! These are massive. They are immense. The damage is going to make a difference. He's taken a chance. He's been brave but well done, David. and our dazzling duo are just outside Glasgow in the town of Paisley. With a lot of catching up to do, are you feeling a bit nervous, David? -Our very, very last auction. I'm far too nervous to talk about it. We've both got potential for profits, David. Yeah, we do actually. We do. But we've also got potential for losses. You have taken some chances and I love you for it, I really do. It makes it very exciting. and is taking place at Collins & Paterson Auctioneers. Wielding the gavel this morning is Stephen Maxwell. The Titanic should sell really well, I think. as well, so I'm very confident it should sail off at a good price. so I have my doubts as to whether they might sell particularly well. Only time will tell, so let the auction commence. Oh, it's so exciting, eh? Calm yourself, David. First up, Anita's brooch. -Oh, good, I was going to get excited at that. ..18, at 20 now is your bid, sir. At £20 has it. I need a wee bit more. At £20. Gone to number 289. -Mm... Not brilliant. Not brilliant. A disappointing start there for Anita and that was her safe item. I feel fantastic. Absolutely... I'm ecstatic! -Sorry, did I say that out loud? Will he be quite so smug after HIS first lot, the silver bowls trophy? At 15, in at 15. 15, I have here. Are you bidding? Oh, £18. 20.
though he's going to need to do better than that to catch his rival. I'm getting there, Anita. I'm catching you. I'm catching you up. Can his tea caddy shrink Anita's lead even more? -It should double its money. I'm going for the 100%. I'm going double bubble. -It's a wee bit tired, David. -I know. Well, aren't we all? If you'd been around since 1820, you'd be a bit tired. Any tea drinkers in today? Come on, now. £30, surely. At £20. Thank you, madam. £20 we have. Do I have 22? 22 at the back. 25? -We'll sell it, then, at £25. -It's not double bubble, so I'm not happy. Still, not a bad profit though, David. Next, it's Anita's letter rack. Thank you, sir. 25, I have straight in. ..35, 38? The bid's now at the back. It's with the gent now at £38. That's all right. Are you pleased with that? -You've made back the loss. -It doesn't take much, does it? Apparently not. Another nice little profit. -Are you very, very happy? Let's see a big smile, then. -Good Scottish glass lamp, this. Start there at 20, surely? 20. Thank you, sir. £20, we have. 20 bid. Do we have...? 22 at the back. 25? No, you're out, madam. With the gent at 25. -This is going to be horrible. No. That's terrible. I knew it. I knew it. But I loved it. What can you do? What can you do? Well, bad luck, David. It's a big loss. Just not what he needed in this all-important last auction. She got this for a steal but will it live up to its potential? I love it. It's modernist, it's French, it's, "Ooh, la, la." ..on the candle holder. At 22, the gentleman. 25? Now it's your bid, sir. It's in the room and 32 has it. -Well, I never. That's taken off! 80, 5, 90, 5, £100? -Crikey, and it's still going! -I thought it would sell for a fiver. You're out. The bid's with the gentleman in grey. We're selling to the room, fair warning to you, at £290. -Gone. It's yours, sir. 290 there. That's my Titanic then, isn't it? Never mind that thing. Unbelievable. It really was an incredible buy. That amazing profit has now pushed Anita even further into the lead. -Well, I must say that I'm quite happy about that. -You should be doing the blinking cancan. Do that if you like. Well, David, you've really got your work cut out now. It's your modernist golf trophy up next. £10 for the trophy. £10 surely for the trophy? Any advance on £5? 8, the lady now! £10. Are you back in at £12, no? 15. Still with the gentleman. We're selling at £15. Gone there! A fiver. I need a lot more than that to catch you. Anita's laughing policeman's head was an unusual pick. Let's see how he does this morning. Yes, a papier-mache fairground head of a laughing policeman, no less. I never thought I'd say those words in an auction room. Interesting lot. What can we say about it? Where would you start? I have no idea. How about £20? Yes, thank you, sir. Straight in at 20. £20, we have. Do we have 22? 32, 35. For the same gent at 35. Any advance? We're selling then at £35. but clearly not to the people of Paisley. But her last item was the big gamble. Time for Anita's Titanic model. Will it sink or will it soar? I'm hoping it will sail away to somewhere nice shortly. £100. Thank you, sir. Gentleman has the bid at £100. 110 bid. -The room's going quiet now. -..160, 170. The bid's here at 180. Are you bidding, sir, in white? 190, 200? with the gentleman. Selling at £200. Wiped its face. Now, Anita must be massively relieved with that result. on David's beloved Meiji vases. David might be behind but could this all be about to change? I could make a bit of profit but I'm not going to catch up to you, am I? Come on, David. Where's your fighting spirit? Stiffen up, man. -£100 surely for the pair. Go on! Ahem. Sorry, did I say that out loud? to start the lot at 50. Just a starting point. 50 is with me. Do we have 5? 55 bid. £60? You're out. Still with me at 80. It's on commission at 80. Do we have 85? Still with me at 80. We'll sell them, then, at £80. You won't. Don't sell them, don't sell them. Crikey, someone's got those for a bargain. Bad luck, David. -Cup of tea, cake, regroup and do the figures. So, at the end of five incredible auctions, the results are as follows. Anita started out with £565.25. with a spectacular final figure of £725.31. Well done, Anita, and all profits go to Children in Need. So, you know what? That's one each. and I'm going to re-challenge you. Be it on your own head! -And the roof is off! -Do you like men in uniform? But above all, an unbreakable bond has been formed. I've got on a Marks & Spencer silk vest. David Harper and Anita Manning embark on the final leg of their trip, starting in Ayrshire and travelling to the Isle of Bute, Glasgow and Renfrewshire. They each take a massive risk in a bid to win the week, but who will come out on top when they head to the deciding auction in Paisley?